Interior Signage . . . Functional Yet Beautiful! Interior Signage for corporate image and branding as well as function and aesthetics. Make an impact! Buying and installing a sign can be a complex process as there are numerous factors that have to be resolved. For starters, you have to determine what type of sign you need. Is it going to be lighted? What color, shape, and finish will you need? Where are you going to display your sign? Custom interior signage becomes a focus for one's own business in ways that simply no other kind of advertising can achieve. Custom signage combines the richness of top quality materials with your unique business logo or specific text, delivering an outstanding appeal for your business. A nicely designed custom business sign truly becomes your calling card to potential customers. Interior signs are designed to complement the interior of a building as well as fulfill it's other functions. 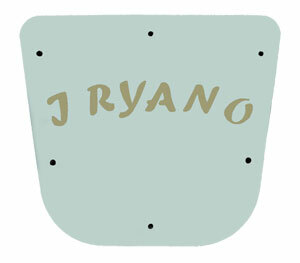 They can be freestanding, hung on walls or inlaid in floors and walls. 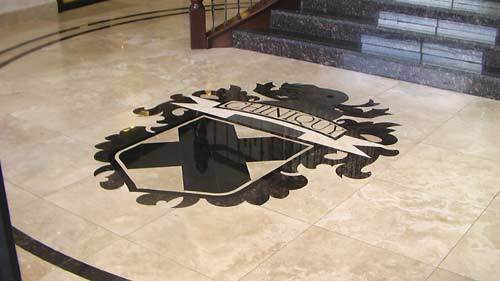 Stone Medallions that are inlaid are typically created for a floor application, but are more and more being specified for wall applications also. Both applications can provide excellent corporate image and branding through business logos and slogans. You know you have hit a "home run" if you can combine function with good looks and aesthetics when using interior signage. Wet Jet Precision offers custom signage in a wide array of materials, which include stainless steel, aluminum, bronze, and brass, in satin and polished finishes. We also offer mild steel and other variations of steel in a powder coat, anodized, or screen printed finish. Whether you are merely wanting to have text cut from brass or bronze, or would like to reproduce the custom colors of your company logo on stainless steel, Wet Jet Precision makes use of its artistic skills to provide a cost-effective solution. When dealing with a multitude of signs, a well planned and thought out sign scheme is very important. If it is new construction, this signage schematic may already be included with the architect's plans. An existing building should also demand a well thought out signage plan. At Wet Jet Precision, all of our signs are custom manufactured to your specifications. Custom interior signage without the typical custom price. Some of the other types of custom signs we create are sandblasted signs, road signs, direction signs, architectural signage and corporate image and branding signs, particularly those in stone. Wet Jet Precision takes satisfaction in their goal of making sure you are receiving the highest quality signs possible for affordable prices.